Here is a man shop window mannequin torso. The square metal base of this mannequin is painted and the height is easily adjustable mannequin It is part of the collection About Display. His abstract head, Ethan, is painted in white. With the position the arm back, this man bust has a mysterious side. This mannequin bust has a modern style and is perfect for all your presentations. It will accent your clothing collections. This bust is available for delivery. 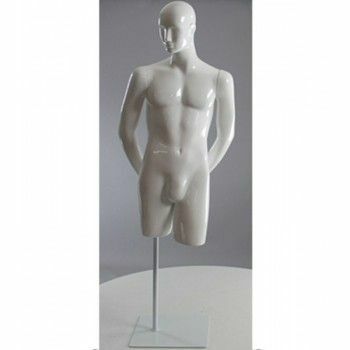 Torso male display mannequin. Base in painted metal square: easily adjustable height. Possibility to repaint the mannequin and color of the finish you want. About Display Collection. Ethan abstract head. Position the arm back. Bust of modern style.